At the beginning of this year, I set myself just one goal: to continue developing my Swirl-StoNZ. Unfortunately I have not succeeded very well with this. Other creative opportunities have come along to take up my time as well as some important non-creative life plans. Half way through the year I even had to turn down several art opportunities, as I simply did not have enough spare time, but others I really felt I had to take up. 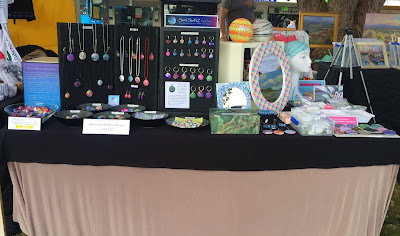 My dot mosaics were supposed to take a back seat for this year, while I concentrated on developing my Swirl-StoNZ. Instead they seem to have taken over. 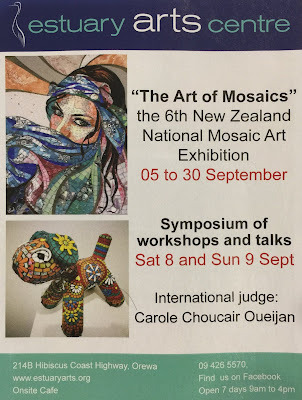 In summary, I had planned to enter a couple of pieces for the New Zealand National Mosaic Art Exhibition 2018 in September but the Estuary Art Centre also put on another Mosaic Exhibition in May, which I was asked to enter. As this was not in my original plan, I submitted my large ‘Watching the sunrise over Rangitoto’ artwork, which had to be re-mounted on board (as it was originally done on a canvas), re-grouted and framed. I was amazed that it sold on the first day. I spent a lot of time creating my two pieces for the New Zealand National Mosaic Art Exhibition 2018, as this was the first time I had entered this biennial event, which was held in September at the Estuary Arts Centre, Orewa. I was thrilled to receive first prize in the 3D category for my sphere sculpture ‘Aotearoa – land of the long white cloud’. 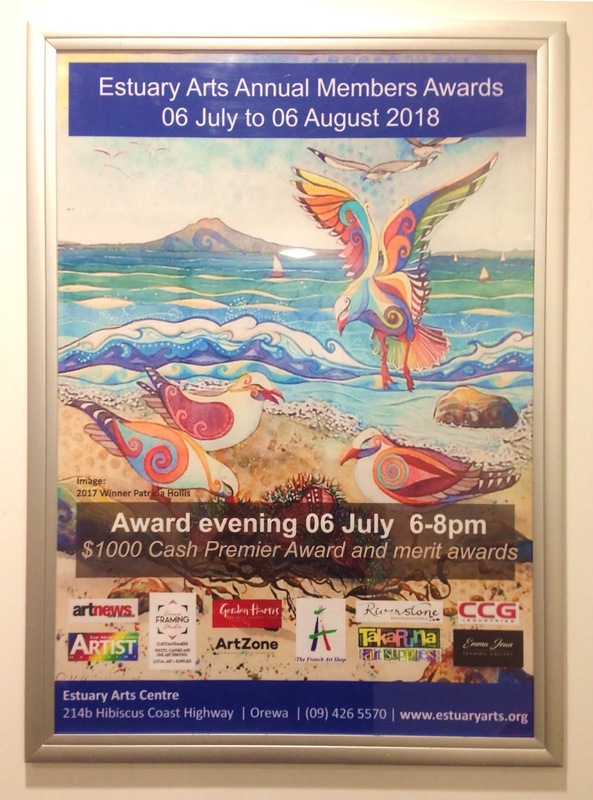 Although I did not sell this piece at this exhibition, I entered it in the Member’s Merit Awards Exhibition held in November at the Lake House Arts Centre, Takapuna. 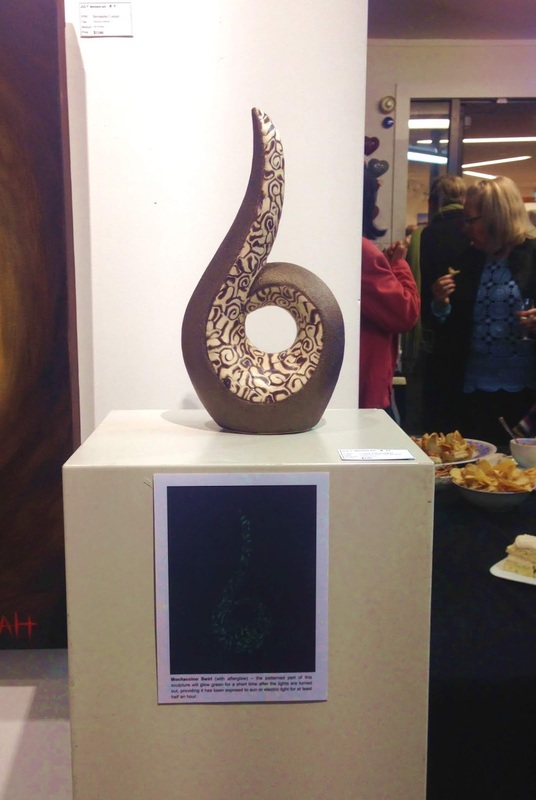 Not only did I sell this sculpture at this exhibition, it won the People’s Choice Award and I was commissioned to do another similar sculpture, which will be my first project of 2019. My polymer dot mosaics will also be featured in a second book, titled 'Polymer Journeys 2019', which is due to be published early next year. The submission of photos and text for this involved some work, as well as my one entry for the 2018 International Polymer Clay Awards. Due to lack of time, I have only been able to create one new piece for this competition. I have been working on it for several months and finally submitted my entry today. Unfortunately, I cannot post any photos until after the end of February 2019, when the judging has taken place. 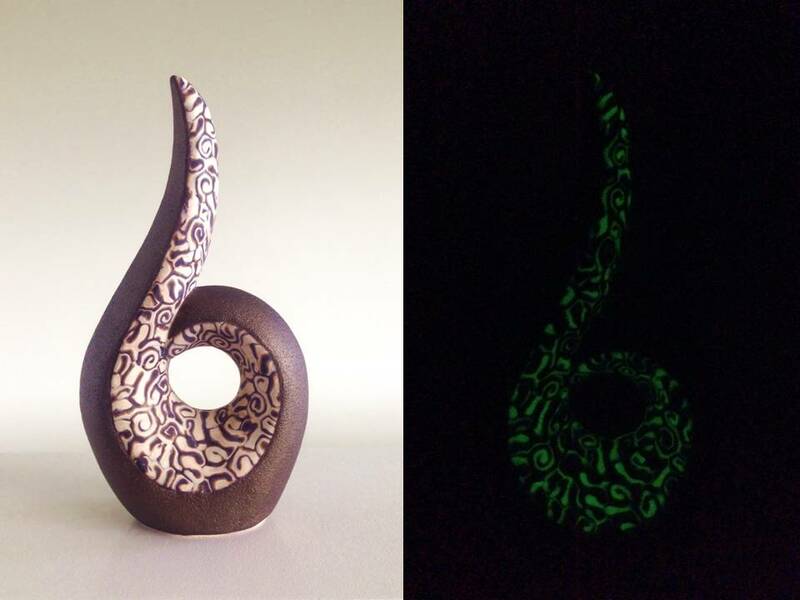 If you use glow in the dark polymer clay, you might be interested in the results of an experiment I started a year ago. 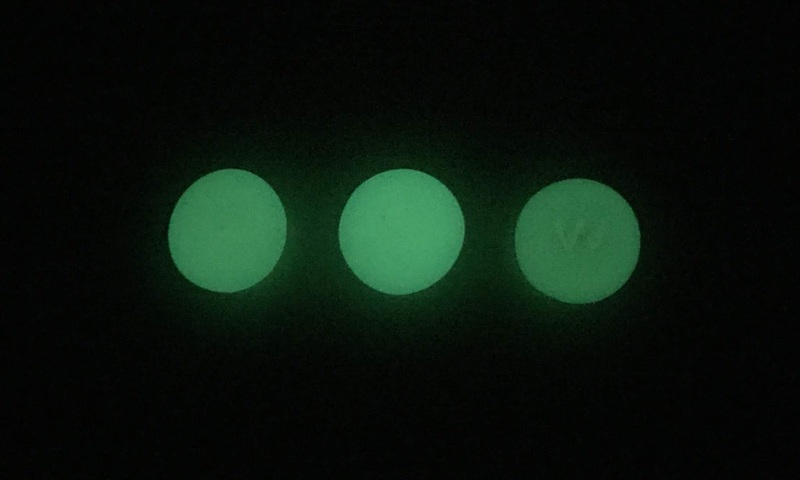 At the time I had started to make my own glow in the dark polymer clay by mixing GITD powders with white translucent Premo, as per the instructions on https://thebluebottletree.com/diy-glow-dark-polymer-clay/ from Ginger Davis Allman. To start with I used the powders from Vadien, as mentioned in Ginger’s article but they cost so much to ship to New Zealand that when I had used those up, I ordered more GITD powder from a local company in New Zealand (www.glowinthedark.co.nz), which seemed to work just as well. I now just use green GITD powders as this colour has the strongest and longest lasting glow. My first observation was that they all looked different colours in daylight. It may not show that well in the photograph but most noticeable was the lentil that had been in the water (after drying) was quite white and opaque looking, it had lost its translucency. 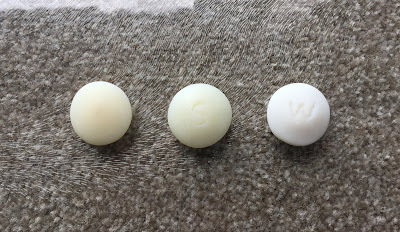 The lentil bead that had been on the shelf was translucent with a slight brown tinge (even though I had used Premo White Translucent and not regular Translucent). 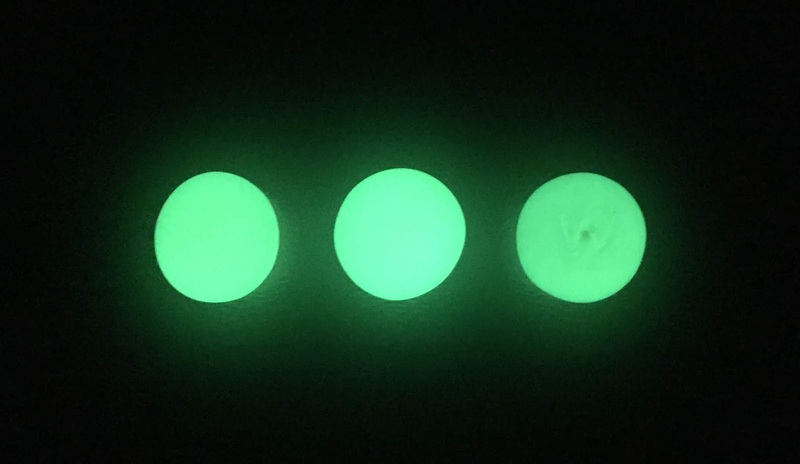 The one that had been on the sunny window sill was translucent with a slight green tinge, almost like it was glowing green but in daylight, I am guessing this was because the photo-luminescent particles in the clay were super charged from being in a sunny position all year. They say 'a photograph does not lie' but my eyes seemed to see quite differently to this photograph. The centre lentil, which was the one that had been on a sunny window sill, appeared much brighter than the other two that seemed to glow the same. After two minutes the centre lentil was still glowing much brighter but now the right lentil that had been in the water was not glowing as strongly as the one on the left that had just been on the shelf. After five minutes the centre lentil was still glowing brighter, the other two were not glowing as strongly but appeared to be similar. As I am writing this, I realise that that there are flaws to this experiment. I should have continued to observe the degree of glow for longer than 5 minutes, say again after 10 minutes, half an hour, and hour, etc. Also, would it have been different if the lentil in the water had been placed on the sunny window sill, rather than on my studio desk which is quite shady? 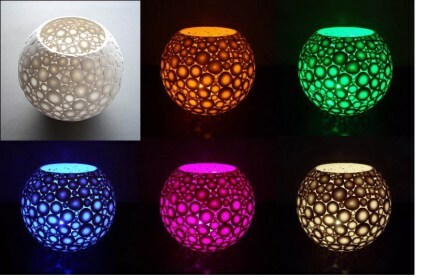 When I started this trial, I was just curious to see what would happen to the GITD polymer clay that had been immersed in water. I do not think I will bother to repeat or refine this trial but I do feel confident to say that the glow in the dark polymer clay made into a lentil shaped 'stone' should be fine for outdoors. After one whole year totally submerged in water, the polymer clay had not deteriorated and the GITD powders incorporated in the clay still glowed. 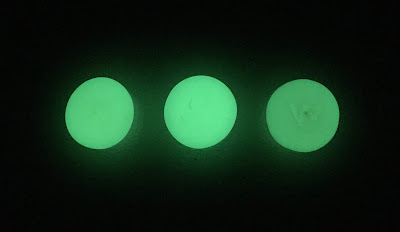 Exposure to sunlight improves the intensity and length of glow time. Just found out that as well as selling my sculpture, Aotearoa - land of the long white cloud, it has won the 'Peoples Choice Award' at the Lake House Arts Centre's 'Members Merit Awards' exhibition. 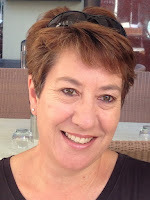 I am thrilled that it has won two awards but will be sorry to see it go. 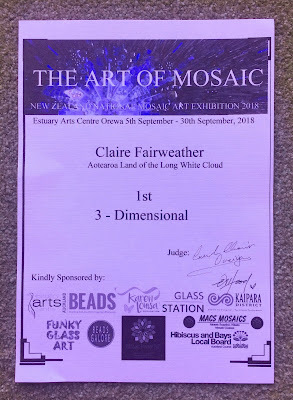 I only have one entry (Aotearoa - land of the long white cloud) in this exhibition but it attracted a lot of interest at the opening night function. 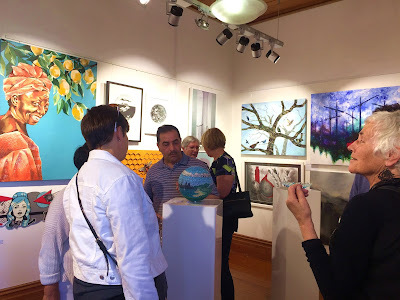 While it did not win an award at the presentations this evening, I am keeping my fingers crossed that it will win the People's Choice Award, from visitor votes through out the exhibition. The weather was perfect today for this market, set by the beach at Mission Bay. 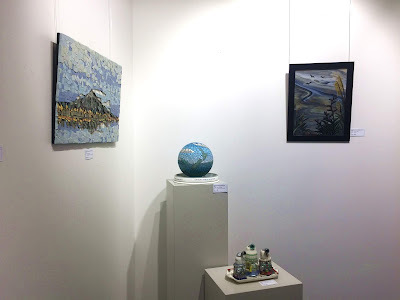 My display was tightly packed, as I needed to clear my studio in preparation for a likely house move. 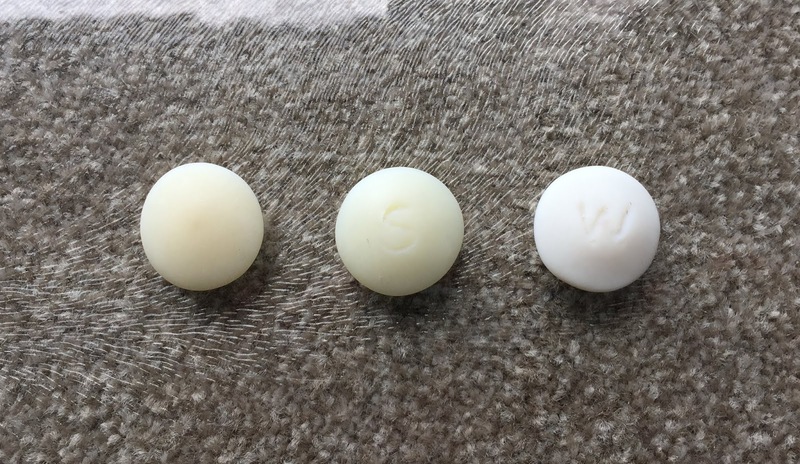 I got a lot of positive feed back on my Swirl-StoNZ and it was a great day all round. The weather is looking good for this event. I will be selling Swirl-StoNZ and various other one-off original pieces on my 'Studio Clearance' table - come and get yourself a bargain! 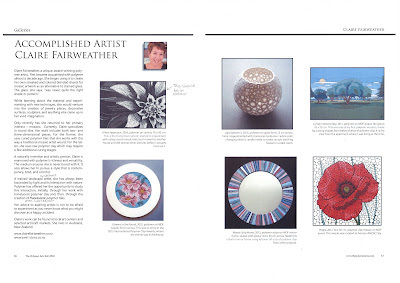 So proud to have been featured in The Polymer Arts Magazine as an 'Accomplished Artist'. Just a shame I did not get to proof read the text before it went to print, as there are a couple of incorrect words, however the photos look great. 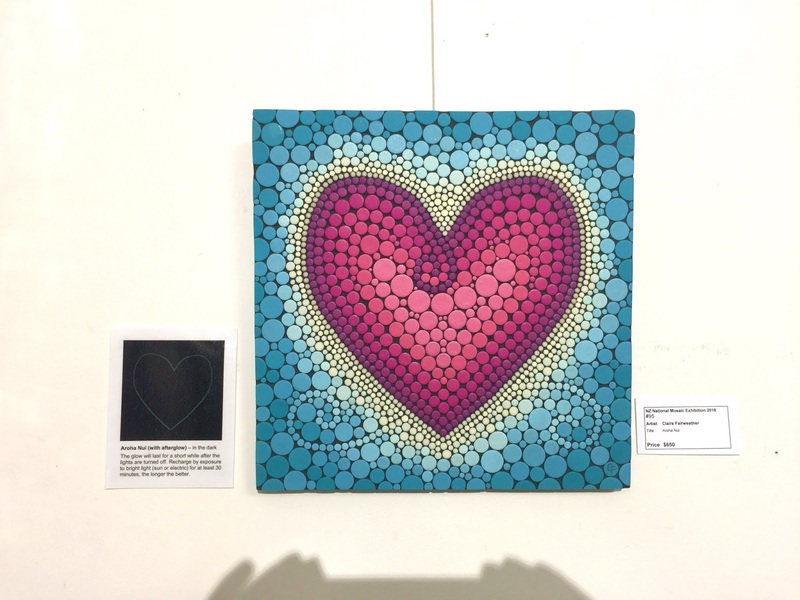 This piece won 1st prize in the 3-Dimensional category in the New Zealand National Mosaic Art Exhibition 2018. The North and South Islands, with the main towns/cities in grey and the topography in shades of green. A sandy beach. There are so many beautiful beaches around New Zealand. Mt. Cook and part of the Southern Alps, with one of the many beautiful blue lakes. The top end of the 'long white cloud' forms into a spiral shape, reflecting the Maori 'koru' symbol. 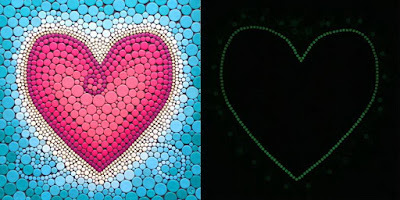 This polymer mosaic is my first one to incorporate ‘glow-in-the-dark’ tiles. They outline the central heart shape when the lights go off, hence the reference to ‘afterglow’ in the title of the piece. Aroha Nui means ‘much love, with deep affection’ in Maori (the language spoken by the indigenous people of New Zealand). 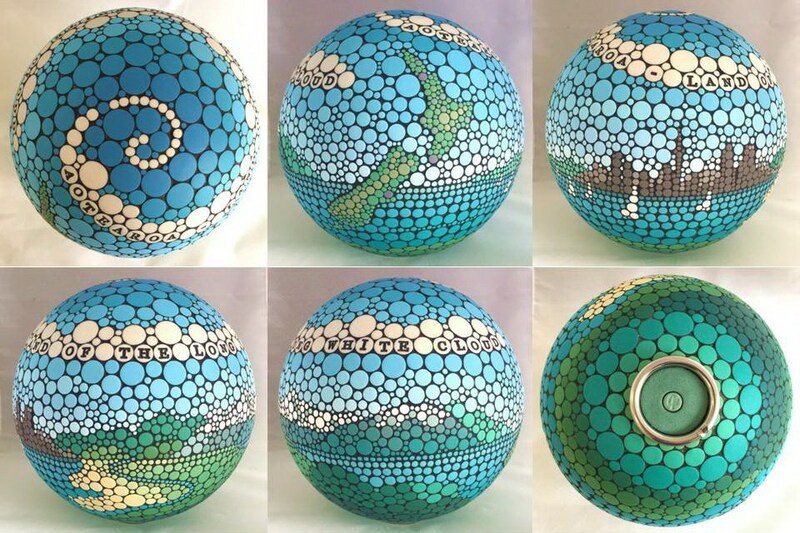 My two entries were Aroha Nui (with afterglow) and Aotearoa - land of the long white cloud. 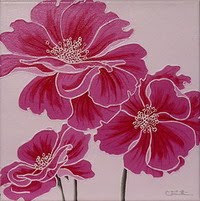 Now that the judging has taken place, I will post more details of each soon. So proud to have won an award, as this is the first time I have entered work in this exhibition. 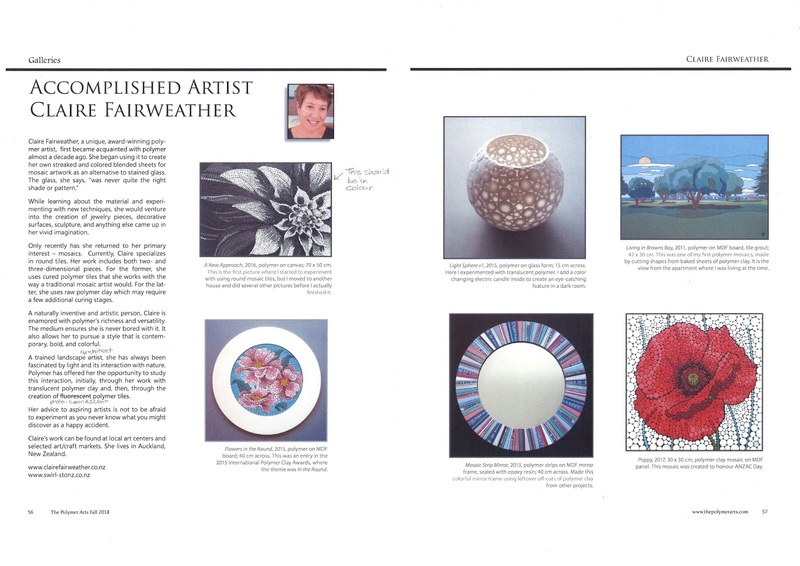 I have just handed in my two pieces for this exhibition. Will post photos after the judging and opening night on Friday 7 September. 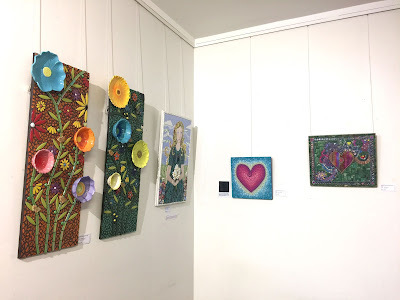 The exhibition will run all through to 30 September at The Estuary Art Centre, Orewa. This my latest sculpture, which is being entered in the Annual Members Merit Awards Group Exhibition at the Estuary Arts Centre, Orewa. The exhibition opens on 6 July and runs until 5 August 2018. There will also be also be three of my Swirl-StoNZ pendants, including 'Prima', which was the very first one that I made. 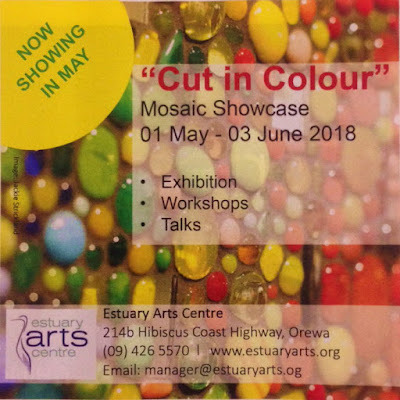 I have entered one large picture, a sculpture and three brooches in this exhibition which is on throughout May at the estuary Arts Centre, Orewa. This is my latest dot mosaic sculpture titled 'Sphere of Happiness'. I was wanting to include words in this next sphere sculpture, which was inspired by a recent customer who requested yellow Swirl-StoNZ because, in colour therapy, yellow is for 'Happiness'. I have chosen to use shades of yellow and orange for the tiles and have included words associated with 'Happiness' by stamping individual letters on some of the circular tiles. You will find the following words spiraling around the sphere: Happy, Joy, Smile, Content, Love, Blessed, Delight, Laugh, Elation, Bliss, Hug, Fortunate, Radiant, Satisfaction, Pleasure, Well-being, Euphoric, Cheer, Enjoyment. This piece is one of my entries in the 'Cut in Colour' Mosaic Exhibition, which will run from 2-27 May 2018 at the Estuary Art Centre, Orewa.